I love a good excuse to make a mess in the kitchen, even more so if it's an excuse to make a really big mess in the kitchen. Mother's Day being the day when you show Mom how much you love her, and what with my penchant for using food to show people that I love them, I knew what I had to do: I had to bake a cake. But as sometimes happens with these projects, it sort of ran away with itself. It went from "I'm going to make a cake" to "I'm going to make a cake, and I'm going to make the filling different from the icing" to "I'm going to make a cake with different filling and icing, AND I'm going to cover it with fondant" to all of the above, where the fondant is not purchased but homemade. This, people, is how people fail out of graduate school: they get sucked into making cakes for Mother's Day and don't get any of their work done. That's not entirely true: I did get some work done this week. But I had cake on the brain, and probably spent more time planning and executing the cake than I did working. I wanted to choose the right cake recipe, the right filling, the right icing. And read up on working with fondant. And research my cake and icing choices just to be sure that a) they were good ones and b) I understood exactly how they were made. Now for those choices. For the cake, we have the vanilla buttermilk cake from Sky High: Irresistible Triple-Layer Cakes, recommended by Deb at Smitten Kitchen. I've been searching for a great go-to vanilla cake recipe, and I think I've found it. It is, hands down, the best I've made. It is light, it is tender, it is perfectly moist; and it stays that way. Another buttermilk cake recipe I tried in my miniature mock-up cake did not hold up well after a night in the fridge, but this: I made the layers Friday evening, I assembled the cake Saturday, and we cut into it today (Sunday). And it was fantastic. Next: the filling. I already posted on the lemon curd, so that recipe needs no introduction. The curd went on top of the first layer (after I piped a dam of icing along the edge of the cake layer), and I covered it with fresh raspberries. I spread a bit more curd on top to make the layer uniformly thick. And the icing: just as the cake is my new favorite vanilla cake recipe, Swiss buttercream is my new favorite icing. It's brilliant. And that's all I'm going to say about it at the moment, because I'm planning another post on it. Finally: the fondant. Like Play Doh for bakers. Originally I was going to use purchased fondant, but as it turns out, Wilton's fondant doesn't taste that great. So I made my own. If you're interested, Joe Pastry has a thorough tour of the fondant-making process. It's easily made, and not terribly difficult to work with. And since my piping skills need some work, ahem, I felt better about using a fondant cover on the cake than trying to pipe a bunch of decorations. One of these days I'll do what I ought to do: make a batch of icing and just practice, practice, practice. Meanwhile--and perhaps this reflects poorly on my mental health--I'm not-so-secretly hoping that someone close to me will suddenly have the need for a cake, maybe even a tiered cake, but not the budget (or inclination) to buy from a professional. I don't anticipate any pregnancies or engagements among family or friends in the near future, so I suppose I'll have to wait for Father's Day or a birthday. Just as well--I need time to plan my next project! Your cake looks even MORE delicious from the inside, Anne. I'm very intrigued by that vanilla cake recipe, because I've never found a "scratch" recipe that didn't go all heavy and dense . . . no matter how good it tasted. In England, you can easily buy ready-to-roll fondant icing. They call it royal icing. It is one of the few baking things that I wholeheartedly recommend just buying . . . as opposed to making. Oh! I'm sorry, I didn't realize that royal icing meant something different there. Here it's a spreadable icing that's often used to pipe decorations. 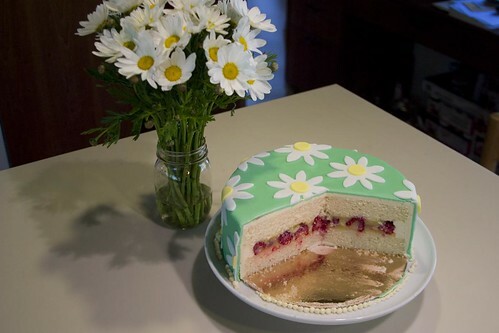 Definitely give this cake a try, Bee. I know what you mean: the other cake recipe I was thinking of using went heavy and dense after a night in the fridge, but not this recipe. 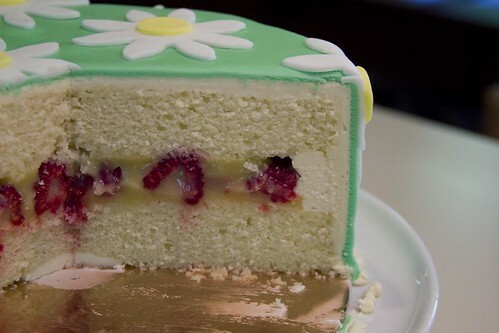 This morning (yes, I am having cake for breakfast) it's starting to dry out a bit, but a) now it's been cut open, so it doesn't have the buttercream sealing in the moisture, and b) I'm eating it straight from the fridge, and it would probably improve when brought to room temperature. But it's still very light--I'm amazed at how well it's held up.